What is happening to my city? This is not the usual writing readers of this blog are used to, but I am truly distressed and saddened by what has been happening here in London in the past 72 hours. The violence, looting, destruction of property and people’s livelihoods is hateful, depressing, selfish, contemptuous, vicious and frightening. The weakness of our leaders — those in government and opposition — in the face of the crisis, is particularly galling. That the police seem completely overwhelmed and unable to act decisively doesn’t fill me with confidence. My paranoid sense that delinquent youths all across the city are being emboldened by the current mood has ratcheted up my anxiety an unwelcome notch or two. I want a more robust response from the authorities. I want them to act quickly to stop the rioting and restore order to the streets of London. BUT… hold on… calls for the Army on the streets? This is always the danger with crises like this — that people surrender totally to fear and start to call for the most outrageous and unacceptable things. Not only is it wrong for the Army to be on the streets in a supposedly democratic country, but its presence has the potential to fan the flames of riot and unrest, not quell them. I totally condemn what is happening. But condemnation on its own is just a dead-end. We condemn. Then what? When the dust settles, we still have to look for solutions. Condemnation on its own is far too easy — so easy, in some mouths, that it becomes a sort of narcissistic vigilantism. Many commentators, for example, have been describing the rioting as “mindless.” I’ve used the term myself in the last couple days. The thing is, it’s not. I understand why we use the word: it expresses our incredulity at what is happening and points to the counter-productiveness of the thing. But people who riot do have minds, and in these lie the reasons for their rioting. Sure they are bad reasons, even if they are miserably explicable. They are not justifications or excuses. Call them motives, if you prefer. These may be greed, hatred, a craving for status, for battle and excitement and for an antisocial sort of liberty. Some deep, possibly incoherent rage against authority and a safer, kinder, more prosperous society they somehow feel they can’t join might be part of this story too. None of this is evidence of mindlessness, and to declare it so is to hide from reality. The thing is, when events like this occur, the response is often a highly emotional one. People reach for simplified points of view. You’re either for or against. However, this is exactly the kind of response that feeds the climate of unrest in the first place. As with the student protests last year, our condemnation of the criminality and support for the police in their attempts to restore order in the short term must be therefore balanced, in the long term, with analysis of the events with reference to their wider social and economic context: unemployment, poverty, disaffected youth, crime or even historic tensions with the Metropolitan Police. My heart goes out to those who have been hurt, or lost homes, businesses and livelihoods. I hope and pray that calm returns to the streets of London tonight and that this city that I love will return to normal. And somehow, I hope, something good and positive will come of this! 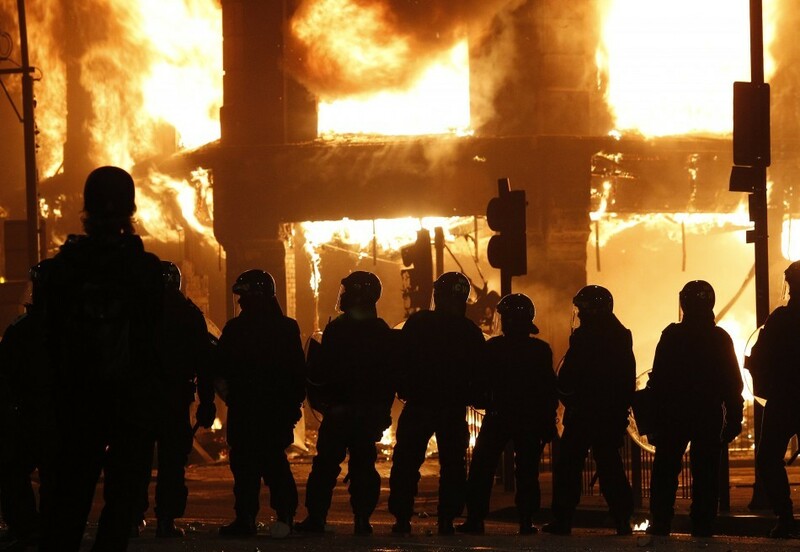 This entry was posted in Life, London, Politics and tagged London, riots by intothenightlife. Bookmark the permalink.